Cockpit of the Boeing 737-300 with "EFIS"
The evolution of the flight deck is an interesting topic to study. Over the decades, flight decks have evolved, getting more and more electronic with extreme underlying complexity, automated and arguably as crew friendly as possible. There is only one aircraft family in this entire world that is still in production, and yet has been around for long enough to have seen the flight deck evolve. The Boeing 737 family. The Boeing 737-100 and 200 sported an all mechanical, basic two crew flight deck. Gradually, the 737-200 evolved into an “Advanced” airplane, with the addition of a useful autopilot, and a computer that helped make performance calculations easier. Then was launched the aerodynamically improved 737-300 with more economical, higher bypass ratio engines. 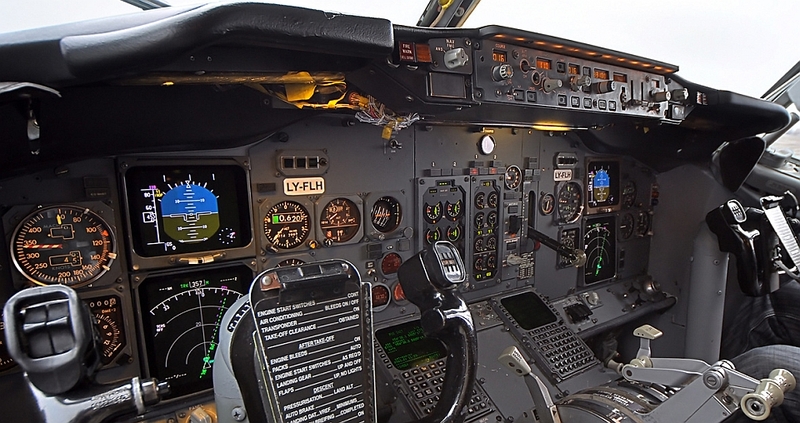 but it wasn’t just the mechanical portion of the aircraft that changed; the 737-300 flight deck appeared just like the 737-200 with two key differences: a Flight Management System (FMS), and a standard auto throttle. This made flying so much simpler, but then, pilot situational awareness could have been better. Then came the EFIS cockpit for the 737-300,400 and 500 members of the world’s best selling aircraft family. Displays similar to the Boeing 757/767 were incorporated, with map displays significantly enhancing pilot situational awareness. there still were mechanical gauges, but the transition was welcome. When Boeing launched the 737 Next Generation (NG) subfamily of airplanes, the deck had undergone a significant overhaul, most notably to the forward panel. The overhead wasn’t too different; neither was the pedestal or the throttle quadrant. The mechanical gauges that had populated the front panel were no more, all replaced with more reliable LCD displays. Intelligence with the Engine Indicating and Crew Alerting System, made trouble shooting easier. The 737 NG’s flight deck, is one example of a modern day airliner cockpit. So what changed? How did they change? And what was needed and essential? This section on the evolution starts off with the Boeing 737-100/200 cockpit, progressing slowly to the latest 737 NG cockpits, while appreciating the need for the cockpit systems and displays that have become standard today.